As new research shows, this artist’s depiction of the flight pose of the pterosaur Coloborhynchus piscator is probably wrong. The popular conception of pterodactyl flight shows them in a pose with wings and legs spread far apart similar to the way bats do it. But as new research shows, it’s very unlikely that flying reptiles were able to move their joints and hind legs in such a manner—a finding that could influence the way scientists study mobility and movements in extinct animals. When reconstructing extinct animals, paleontologists rarely, if ever, have the benefit of working with soft tissue, such as ligaments. Thankfully, fossilized bones tend to retain the correct physical orientation of a dead animal, but there’s no tissue showing how muscles or ligaments may have constrained mobility. As new research published yesterday in Proceedings of the Royal Society B shows, paleontologists may not have soft tissue to work with, but they do have an important resource: living relatives. In this case, scientists from Brown University and the University of California, Berkeley inferred the movements and posture of flying reptiles by studying the hips of modern quails, a living bird and the closest living relative of extinct dinosaurs. Quails were chosen for the study because they’re proficient on both land and air, and likely a good approximation of pterosaurs, a group of flying reptiles that includes pterodactyls. The new research shows that pterosaurs weren’t capable of bat-like flight, which is the common conception. 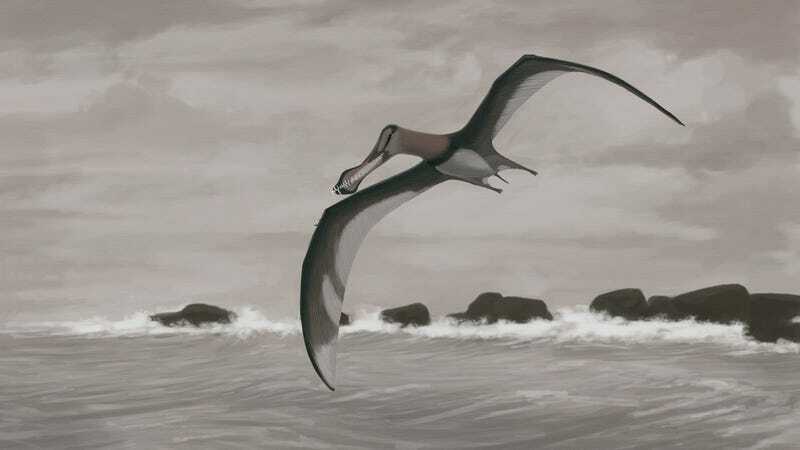 The authors of the new study don’t know what the flight pose of these animals looked like, but they’re fairly certain that pterosaurs, and possibly four-winged dinosaurs, didn’t fly with their hind limbs splayed wide apart. And that’s because this pose was likely physically impossible for them, as suggested by the comparative analysis with quails (it’s important to point out that pterosaurs were not dinosaurs, as their shared ancestry goes back further in time). Armita Manafzadeh, a PhD student in the Department of Ecology and Evolutionary Biology at Brown University and the lead author of the new study, says she got her idea while handling grocery store chickens. Indeed, paleontologists typically use a “bones alone” technique to infer mobility and motion of an extinct animal. To test the validity of this method, Manafzadeh applied the technique to quail bones. If we knew nothing about quails, she wondered, and if we tried to infer their motion from bones, what would we expect to find? And how wrong would we be? Nope, not like this. The popular conception of pterosaur flight, with hind legs spread far apart. New research suggests this pose was impossible. Turns out we’d be very wrong. For the study, and with the help of Kevin Padian from the University of California, Berkeley, Manafzadeh took some quail hip joints, cut the surrounding muscle, and manipulated the joints while recording x-ray videos. This allowed the team to determine the 3D positions of bones in poses where the ligaments prevented further movement, and to quantify, in three-dimensions, everything the quail’s hip joint and legs could and could not do in terms of mobility. After this, the researchers ran a separate experiment in which they inferred the mobility of the quail’s hip using the “bones alone” approach. This technique required them to map the quail’s mobility by stopping when the bones touched each other, and when the movement pulled the thigh bone out of the socket. The bones alone approach, this experiment showed, is both inadequate and inaccurate. Nearly 95 percent of the poses that seemed plausible with the bones alone approach were found to be physically impossible when the ligaments were attached. This included the swinging of the hips outward in a bat-like way. A reliable reconstruction of quail hip mobility using existing ligaments, and not just bone. For the second stage of the study, the researchers sought to compare the range of motion in present-day quail hips with the expected range of motion in extinct flying reptiles. They found that in quails, the outward motion of the thigh bone was inhibited by a particular ligament—one found in a wide variety of modern birds. For pterosaurs to splay their hind legs in the way commonly portrayed, they’d have to stretch this ligament 63 percent more than what’s possible in the quail ligament. The researchers say there’s no good reason to suspect this ligament didn’t exist in extinct, bird-like animals. “That’s a huge difference that would need to be accounted for before it can be argued that a pterosaur or ‘four-winged’ dinosaur’s hip would be able to get into this bat-like pose,” Manafzadeh said. The new study now casts doubt on many reconstructions of flight posture, and it could influence the way paleontologists study joint mobility and movement in other extinct animals, including terrestrial creatures. Pittman, who studies the four-winged dinosaur, says this finding could impact his own work. Comparative analyses like the one presented in this latest study are clearly very helpful and informative, but they don’t offer the complete picture. Until we know more about the soft tissue of extinct creatures, paleontologists will continue to approximate bodily form and function. Thankfully, non-destructive methods like CT-tomography and Laser-Stimulated Fluorescence are providing a glimpse into the apparently invisible, revealing soft tissues in fossils, including bodily outlines and even those involved in articulation.